Quite a few things have happened this week, most of them, rain. When we were looking through the pictures to see if we could find one that was worth showing you, the thing I noticed most was the number of mushroom photos he has taken. 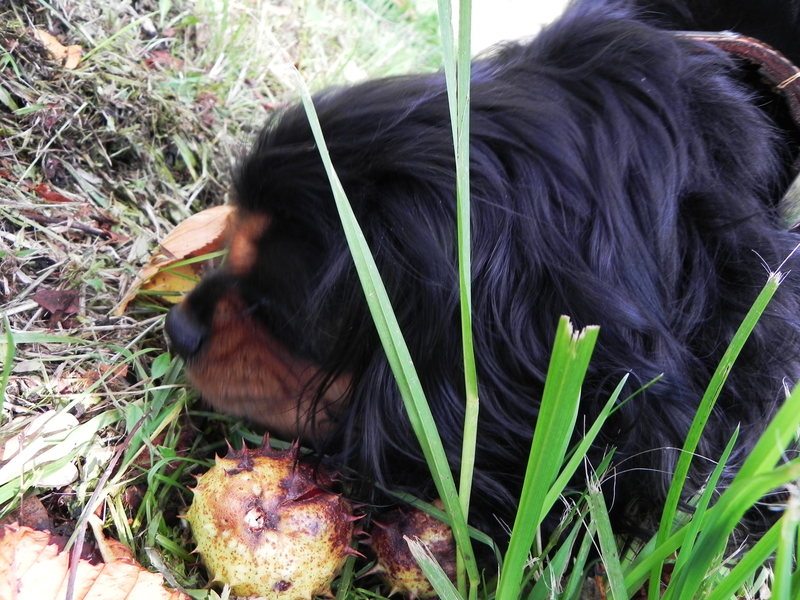 I suppose that mushrooms do look interesting but I found out long ago they really don’t smell that interesting at all. So I wanted to find you something you’d appreciate. Well, perhaps appreciate is the wrong word, shall we just say – something you won’t turn your nose up at? You are probably going to get tired of hearing this but – he just doesn’t know how to go for a walk. We set off in the morning and we stop at the gate. This is a very important place, it’s a bit like Facebook or maybe we should call it Nosebook. We always need to stop here to see if anyone has ‘Liked’ my last post yet. Before I’ve had a decent chance to see what has been ‘scent’, he drags me off down the road. I ask you, how am I supposed to have any social life at all? Anyway, eventually, we stopped to have a look up in some tree or other, he was peering around up there for hours, it was so boring! In the end, I had to take a hand. I think this is what he was looking for. First, I better explain that he is busy over at the new place. In spite of the fact that we are only going to write to you once a week, we still go out for our walk every day. And we still spend most of our walk standing around in completely uninteresting places while he clambers around amongst the brambles of the verge. If I try to do a little investigating of something truly important, he just gets impatient and drags me off quite unceremoniously. I had a look at the photos he has taken while we’ve been incommunicado this week, and to be honest, I couldn’t really see anything that would make your sitting reading this in any way entertaining. In the end I settled for a picture of me. 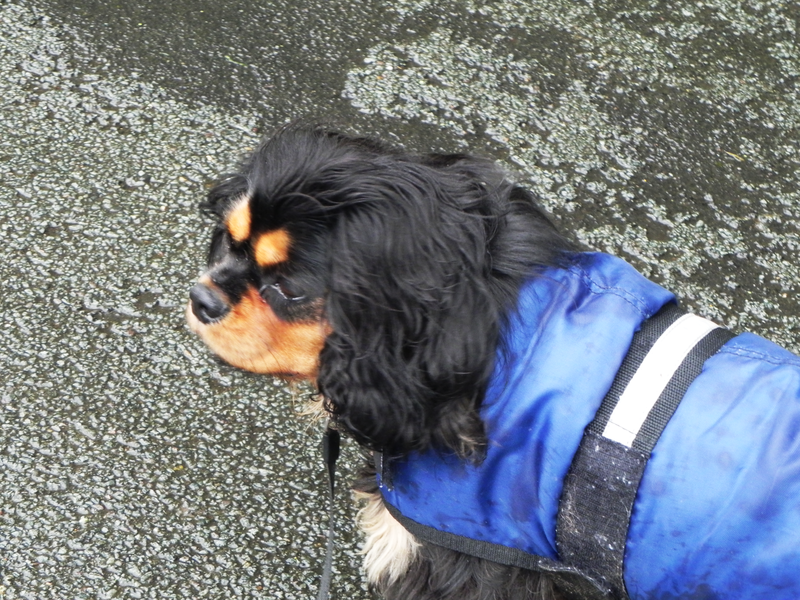 I don’t particularly like having my picture taken and I certainly do not like having my picture taken wearing that idiotic blue raincoat, but other than my photo it was down to some leaves, a helicopter or a train, oh, and there were a few photos of horses and sheep. Really, who would be interested in horses or sheep. As you can see from the picture there will be a new tone to our weekly message while I’m in charge – things will be much more down to earth. Don’t expect any helicopters from me! The Dog, Jackie and I have been living in our new place for just over a year, now. A year ago I set myself the task of posting every day. The main farming activities in the fields that surround us are winding down. The trees are shedding leaves and the flowers are dying back, in preparation for whatever the winter weather has in store for us. So many things seem to have come full circle. I was standing in the back garden this morning, listening to the rattle of acorns as they fell through the branches, with the occasional thump, as an acorn landed on the roof of the house. 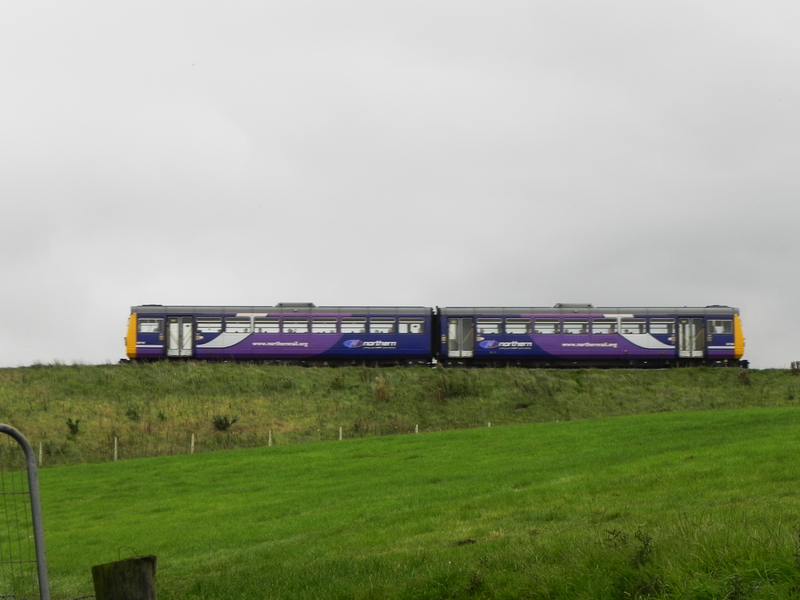 A train came past along our embankment, going at a good lick, downhill, on its way to Carlisle. I watched until it had disappeared round the bend. In the silence that followed, I heard the tap, tap, tap, of the woodpecker, doing a little carpentry, in the trees behind me. All reminders of how delighted we have been with our new home, over this last year. But time and tide wait for no man – Google notes that they have known this truth since at least 1225 and probably earlier. So it looks as though Time and Tide haven’t changed much since then. We, however, are making big changes. From today we will only post once a week – on Friday to start with, but there is no logical reasoning behind our decision, so things may change. This, then, is not the end. It is the start of something new, we’ll be telling you more as it happens. But for now, wish us luck. Hi there over in America – this one’s for you. We found him working as a hedge along a couple of fields, and he asked us if we would mention him to the people back home. He’s settled in quite nicely, thank you, and he’s finding that the locals are just plain folks and easy to get along with. 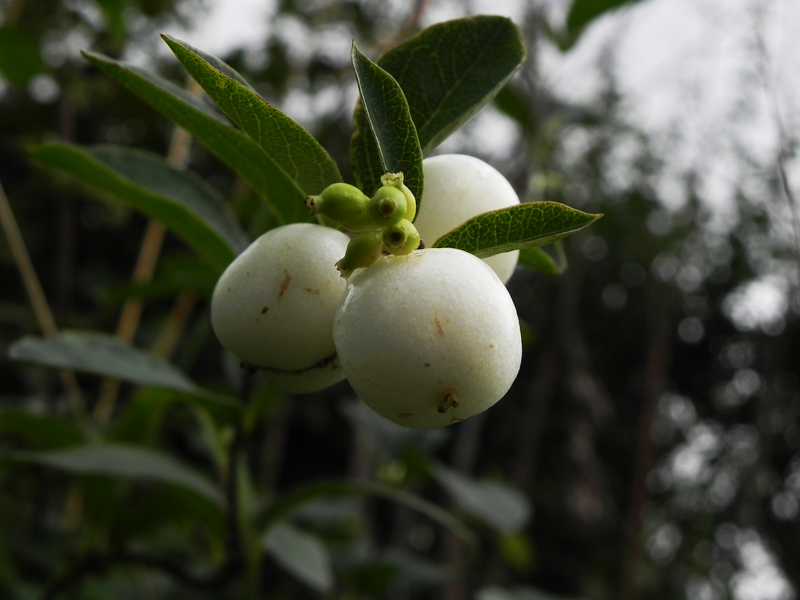 Snowberry or Waxberry are the names he goes by around here. We live on the border between England and Scotland and this part of Britain has seen its share of strife. The Romans tried to stop it by building a wall, when the Romans left, the local chieftains banded together to fight off the Saxons for a couple of hundred years. Just to the north of where we live is a road, known locally as The Military Road, it was constructed to enable English troops to be moved rapidly to quench the fires of the Jacobite rebellion. For centuries the families of the borders have raided and robbed, attacked and ambushed each other with brutal efficiency. Several of the clans were wiped out to the last man, woman and child. Our plant’s other name is Ghostberries. The berries provide sustenance to poor wandering wraiths. With all the unpleasantness we’ve seen around here over the centuries there must be plenty of those around. They’ll have to share though, Grouse are very fond of them too. The wind has decided that enough is enough, and it is time these leaves stopped hanging on to their mother’s apron strings. It has the nasty cold edge we have been expecting for the last few days. Interestingly the grey murky skies have cleared and we have a nice clean blue sky with fluffy white clouds scurrying around in it. There has been a bit of a mix up in the ordering system again, by the look of things. Leaves and seeds are flying around, huddling in little piles in sheltered corners, trying to get out of the chilly draught. We had thought that most of our acorns had fallen and had been round raking them up off the lawn, but this morning the lawn has a fresh coat. The wind is shaking the oak trees so hard in fact, that quite a few larger chunks have come loose and they are now sitting there, waiting for me to collect them up and put them, with their relatives from last year, in the wood store. The other thing the rough edge on the wind has done, is to make us value the sheltered spots on out route. There is still a welcome warmth in the sun and those parts of our walk shielded from the icy blast are jogging our memory. There are places that last winter were milestones in our travels as they provided a little relief from the weather, it’s all coming back to us now. 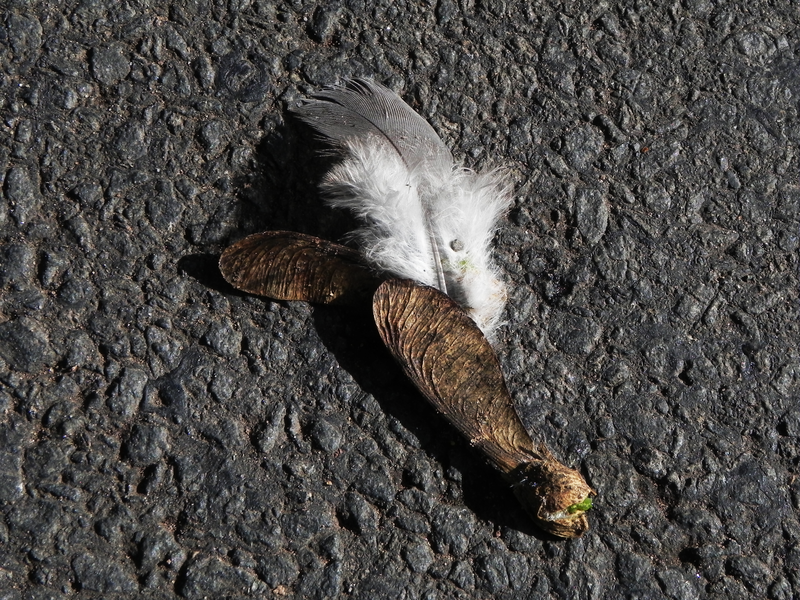 Today, we found this guy in one of those comfort stops, I’m just not sure if using a feather to help you fly is cheating – or maybe a sign of entrepreneurial spirit. Well, we’re here again today and we will do a-blog-a-day until Friday, then we will change to posting just once a week. 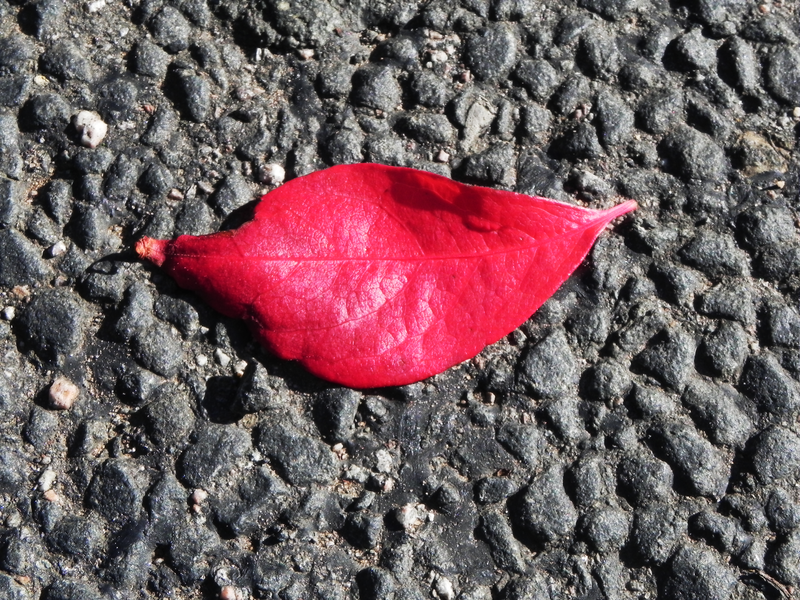 This will be a relief as there is precious little to photograph at this time of the year. We are going to start a children’s story blog and trying to do them both at the same time seems to verge on the perverse. This one will be the Friday blog and we’ll let you all know more about the new place when we know what we’re doing. Until then I thought you might like a train. It’s a Class 142 Pacer and it’s been pottering up and down our railways since it was introduced in 1985. It was built to be a bus. So it has loads of ‘features’ in common with buses. If you look at it you can almost imagine it as a double decker, can’t you. One of the things it inherited from its off-rail ancestors is its simple wheel arrangement. Just straight forward wheels – no complicated bogie here. This means, for instance, that on the fairly tight S bend that has our level crossing in the middle, the wheels do a fair amount of complaining. It’s no wonder it’s been nicknamed The Nodding Donkey, is it? Well here it is. This is our last/first post of the year. In the spirit of modern marketing, not to just satisfy customers but to try our best to delight them, we think we will probably carry on our daily posts until Friday. We wouldn’t want you thinking you didn’t get your money’s worth. When we started the year we set off by train so, to show we’ve gone up in the world, we thought you might like a helicopter at this end of the bookcase. 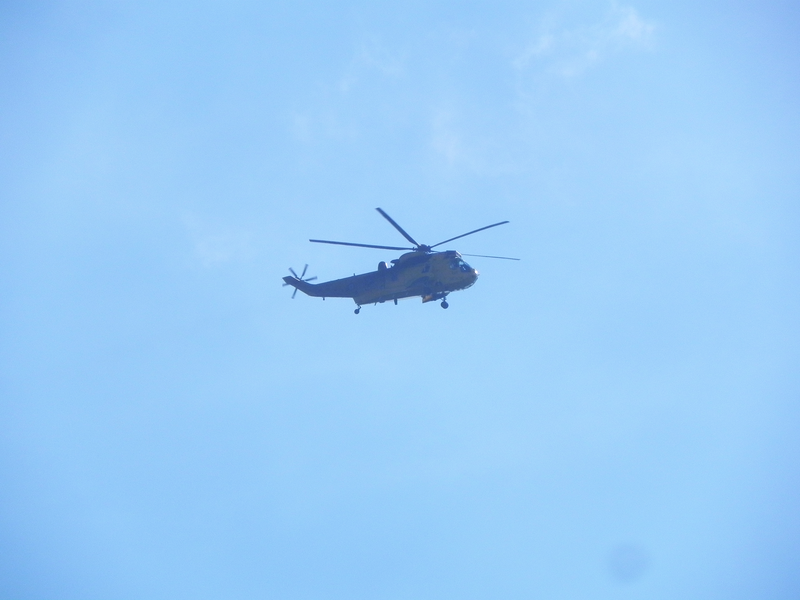 It’s a Sea King, and that nice friendly colour is the sort of thing we associate with our Mountain Rescue team. Writing that, made me wonder under what circumstances a mountain might need rescuing. If it gets a bad case of vulcanitis and blows its top, I’m really sorry, but I think it’s too late for any attempted rescue mission. The only other case that comes to mind, without having to think about it, is if it slipped down a land slide and fell into the sea. Of course, it’s over the other side that the North Sea is trying to fill itself in. It remembers the good old days, before the sea got above itself, when it used to lie round all day as a swamp. It still romanticises about the wind in the reeds and the soft footfall of the mammoth.